Biotinylated Human LILRB5, Fc Tag (CDC-H82F8) is expressed from human 293 cells (HEK293). It contains AA Gly 24 - Gly 458 (Accession # O75023-1). The protein has a calculated MW of 75.8 kDa. The protein migrates as 90-105 kDa under reducing (R) condition (SDS-PAGE) due to glycosylation. 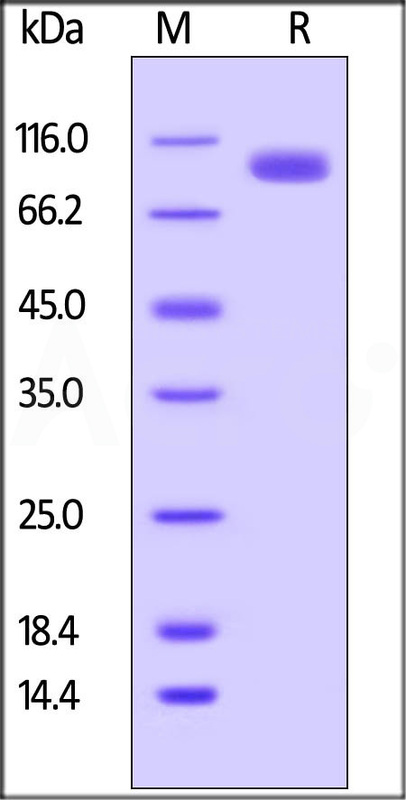 Biotinylated Human LILRB5, Fc Tag on SDS-PAGE under reducing (R) condition. The gel was stained overnight with Coomassie Blue. The purity of the protein is greater than 95%. Leukocyte immunoglobulin-like receptor subfamily B member 5 (LILRB5), also known as CD85c and LIR-8, belongs to the leukocyte immunoglobulin-like receptor (LIR) family of transmembrane glycoproteins that negatively regulate immune cell activation. Several other LIR subfamily B receptors are expressed on immune cells where they bind to MHC class I molecules on antigen-presenting cells and inhibit stimulation of an immune response. (1) Liu T., et al., 2006, J. Proteome Res., 4 (6): 2070-2080. (2) Thomas, R. et al., 2010, Clin. Rev. Allergy Immunol., 38: 159-162. (3) Zheng, J. et al., 2012, Nature, 485: 656-660.